We made landfall in India on 17 March, arriving at about 7pm, just at dusk. Immigration works 24/7, so while we were still anchoring, they were “hovering” with a borrowed boat, ready to pass us a clipboard to fill out. After anchoring, they came aboard and did the initial Immigration processing. 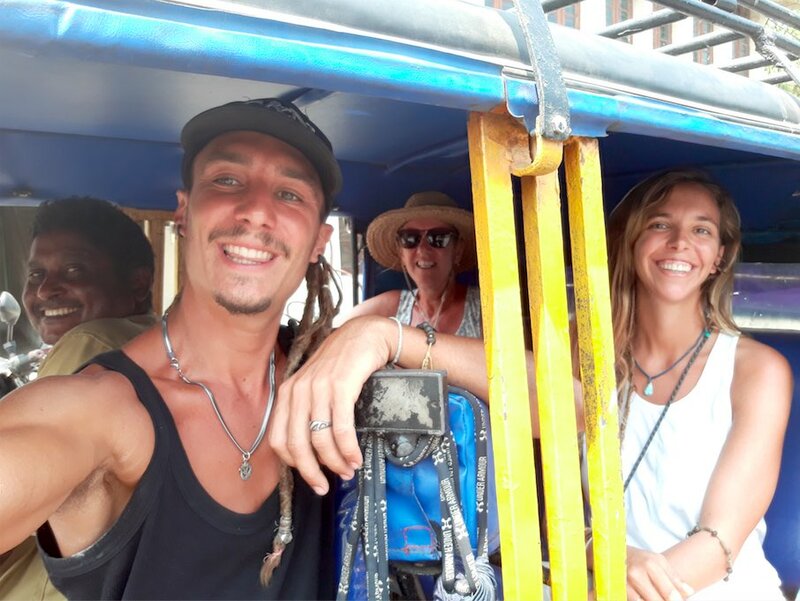 We completed this step the next day when we went ashore and had our first tuk-tuk ride with Nazar. 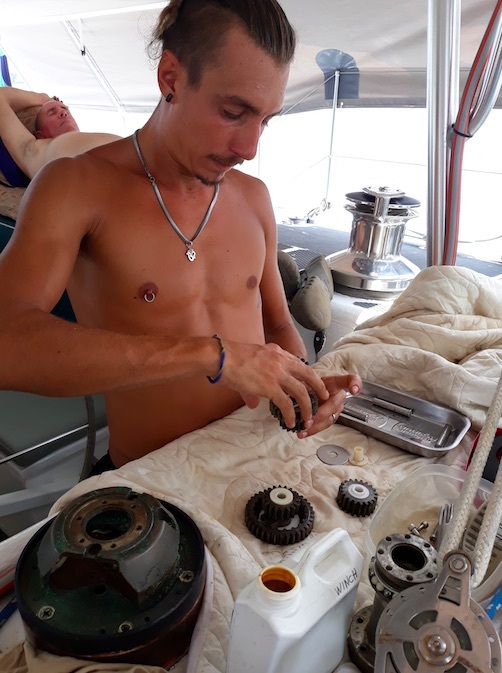 Unfortunately, Customs doesn’t work on Sundays, so we had to wait until Monday afternoon for them to come aboard, and then Port Control gave us permission to move from the Customs/Quarantine anchorage on to the Kochi International Marina at Bolgatty Island about 4nm away. We had to do this at “high” tide (only a maximum of 3 feet in this area). At the marina, we got on the end of a T-dock and secured the boat, although we do seem to sometimes lay on the bottom for a couple of hours every day when the tide is low. 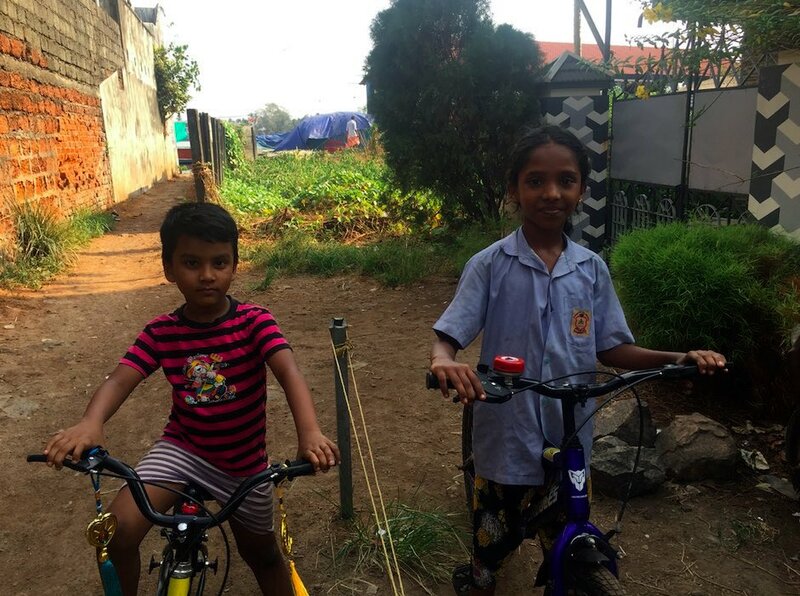 Gabriele and Mariona hung on with us for a week after arriving in India, first to help with the cleaning and tidying up – but next to do some real maintenance. I gave them a contract to take apart and grease all the winches! It put money in their pocket and relieved me of one of my boat maintenance jobs, a job well done. On one Sunday afternoon, a local driver/guide (Nazar) invited us (and 3 other cruisers) to his home for lunch. 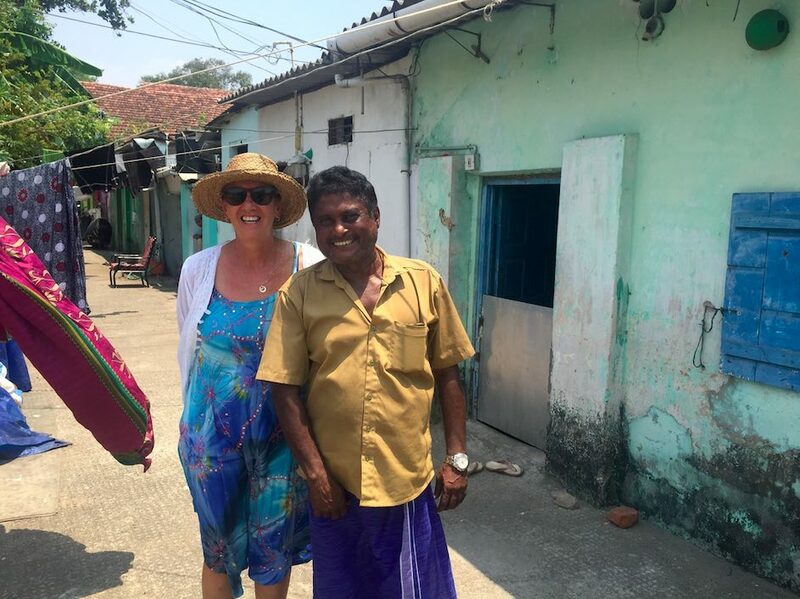 It was an interesting excursion, first taking an Uber, then a ferry and then finally a tuk-tuk to his home. 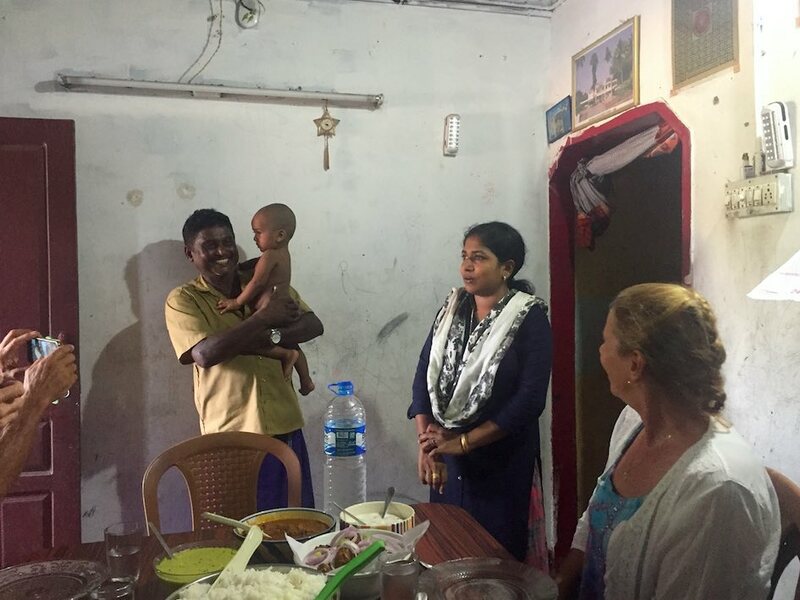 Nazar and his family don’t have much in the way of material assets, but they are certainly blessed with family and friends. Nazar has been very helpful driving us around and demonstrating his local knowledge. 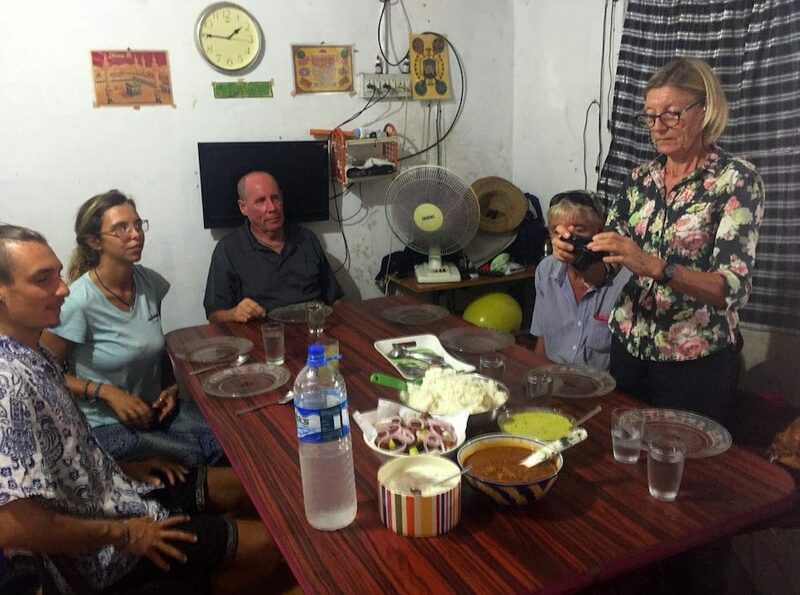 It was a special time to be welcomed into their home together with their children and grandchildren. We bid farewell to our crew on 26 March. 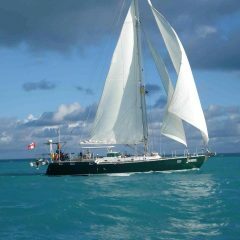 We hope they will come back to join us for the next leg, the passage through the Red Sea all the way to the Med and Cyprus. We have been busy getting things organized on the boat. The first challenge was getting the A/C working well enough. The external temperature fluctuates between a high of 36C in the daytime to a low of 27C at night. Also, the humidity fluctuates between 85% and 65%. Its the humidity that causes us to sweat so much, and makes sleeping uncomfortable. 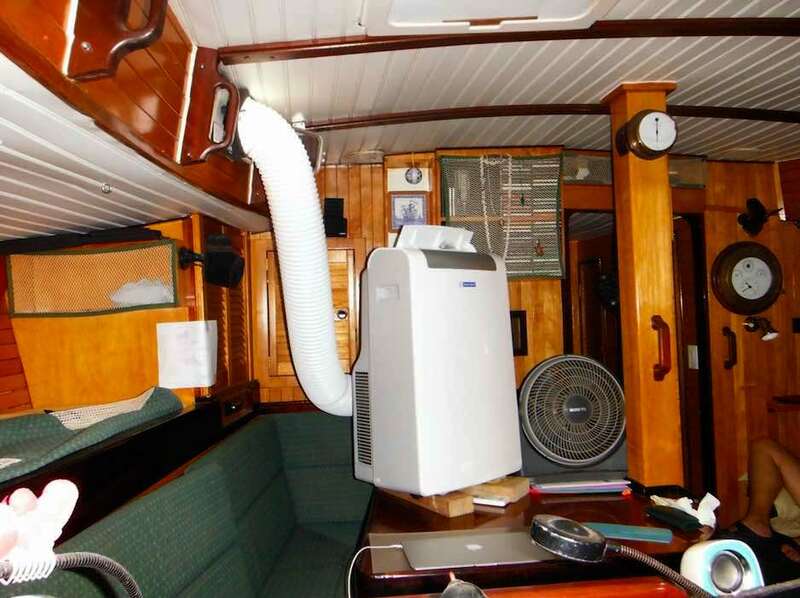 We setup our portable A/C unit in the aft cabin, as usual, and bought a second portable unit for the main cabin. With both A/C units running and our water heater or battery charger operating (both are just temporary loads put on for an hour or so in the morning), we are at the maximum of 16A @ 240V. So far, it is working OK, although the shore power often shuts off during the day for a few minutes at a time. It does produce a lot of water, probably 60 litres per day that has to be frequently emptied. We just haven’t yet figured out how we can actually leave the boat overnight with these A/C units on. Oh, and our aft cabin unit had to have the compressor replaced due to overheating. It cost about $160 CDN to have the compressor replaced and re-gassed, and it seems to be working fine now. We’ve been getting fresh fruit and vegetables at a local market, and sometimes go to the big glitzy shopping market, the LuLu Mall. 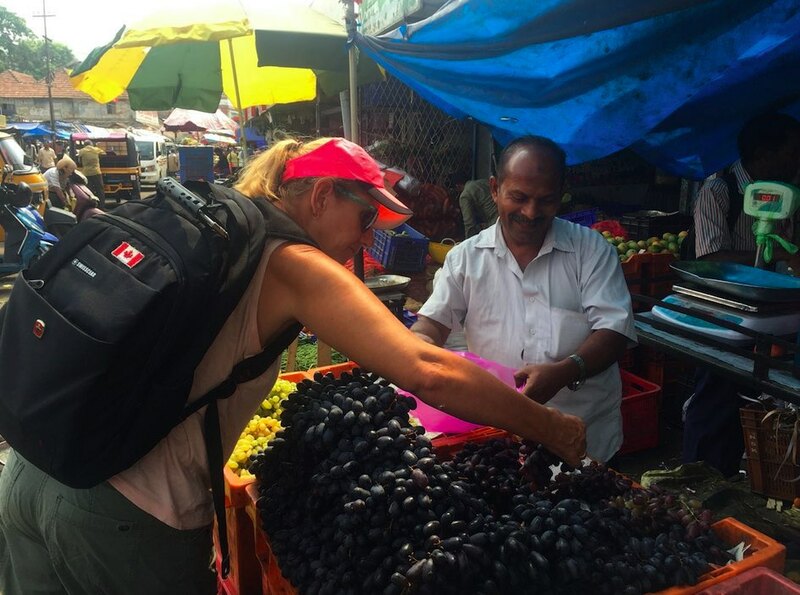 We buy the packaged goods at the LuLu Mall, but definitely buy the local fruit and vegetables at the market. This is a sampling of what the local market looks like. 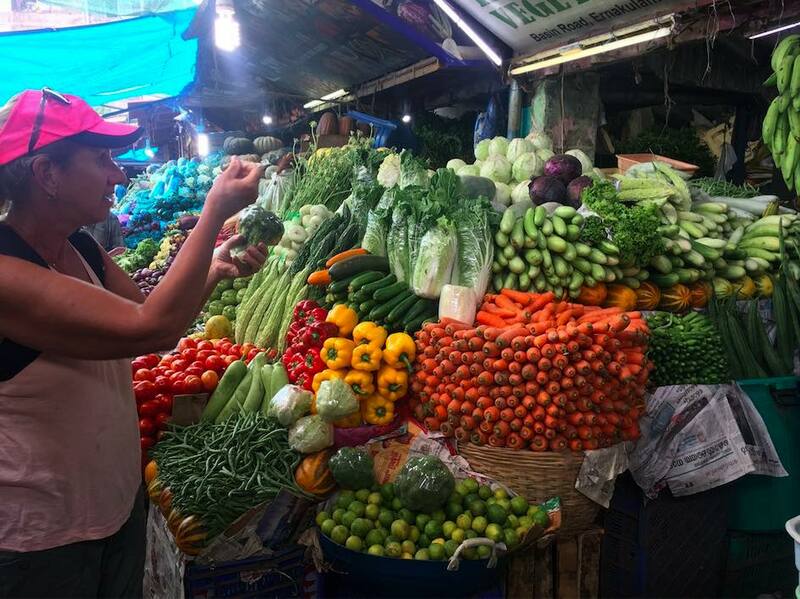 The fresh produce is amazing and cheap. The grapes, red and green – are especially good. 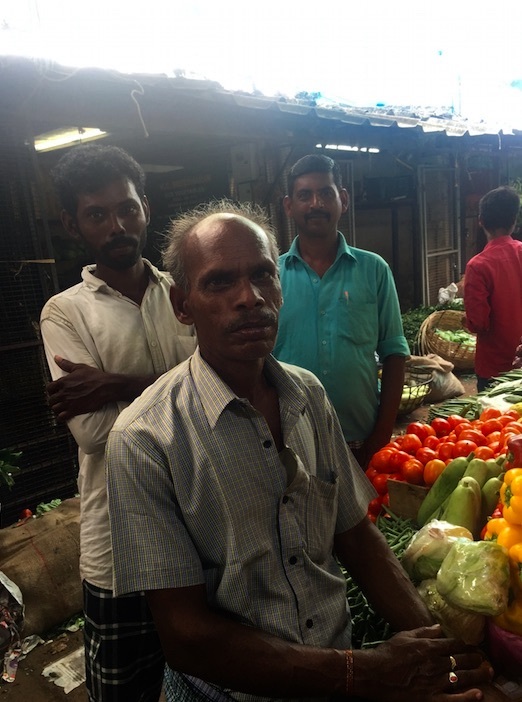 These local guys wanted to practice their English and they asked if they could take a photo of me with them – so I countered by taking their photo! Ah, I’m 62 years old now, and I’ve finally seen first-hand the Indian “bobble-head”. 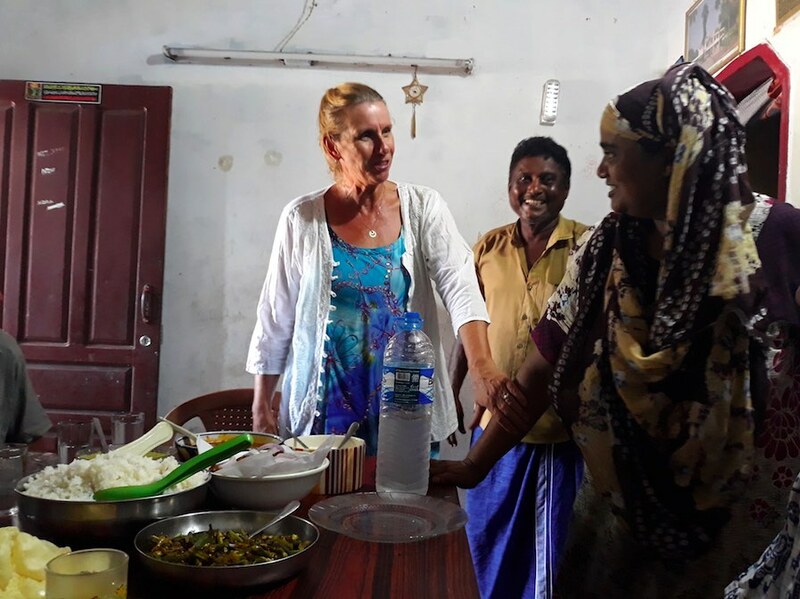 Within the first day, I was talking with a local and his head was shaking back and forth, it looked like NO, NO WAY – but it was the “Indian Bobble-Head” in action. What he was really indicating was yes, he was considering what I was saying and agreed. Without a doubt however, the head wobble is the one universal gesture that unites all Indians. Cultural and language barriers miraculously dissolve with a wobble! 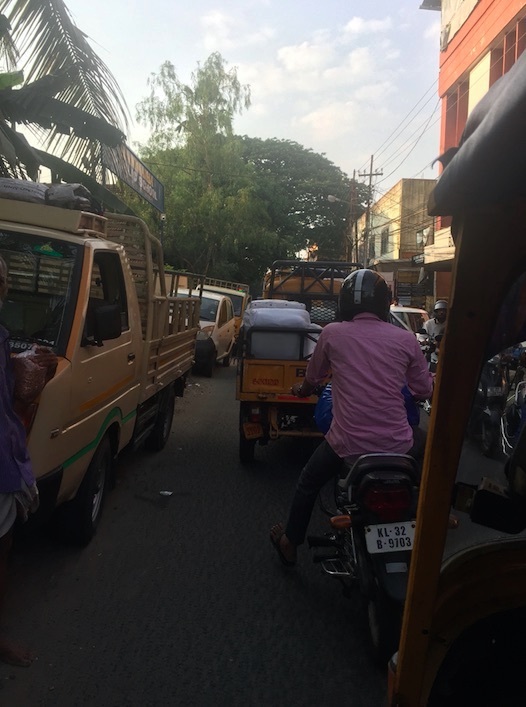 The traffic on the streets in Cochin / Kochi is something to behold. 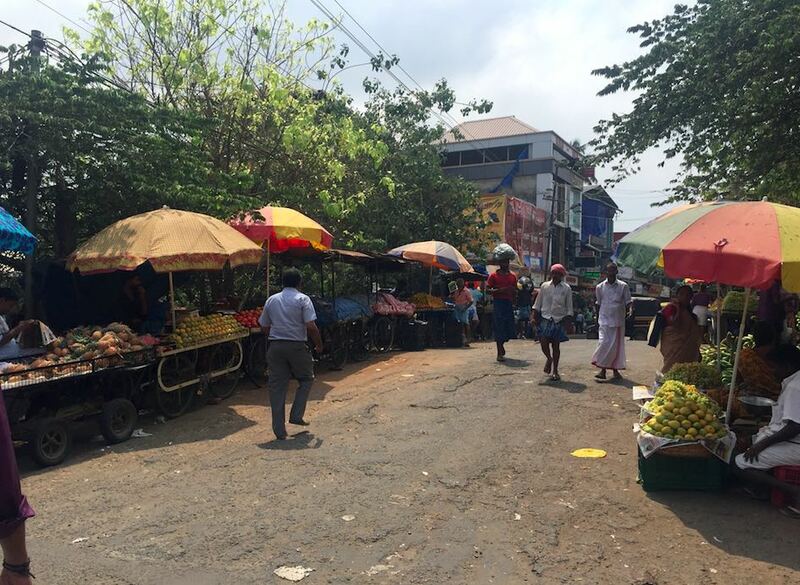 There are bikes, scooters, motorbikes, tuk-tuks (passenger and cargo), trucks, buses, cars etc. I’m amazed to see Mercedes and BMW with no scratches! People are honking their horns constantly and looking for any edge to get ahead. These little kids don’t look too stressed about it. I think they keep off the streets. 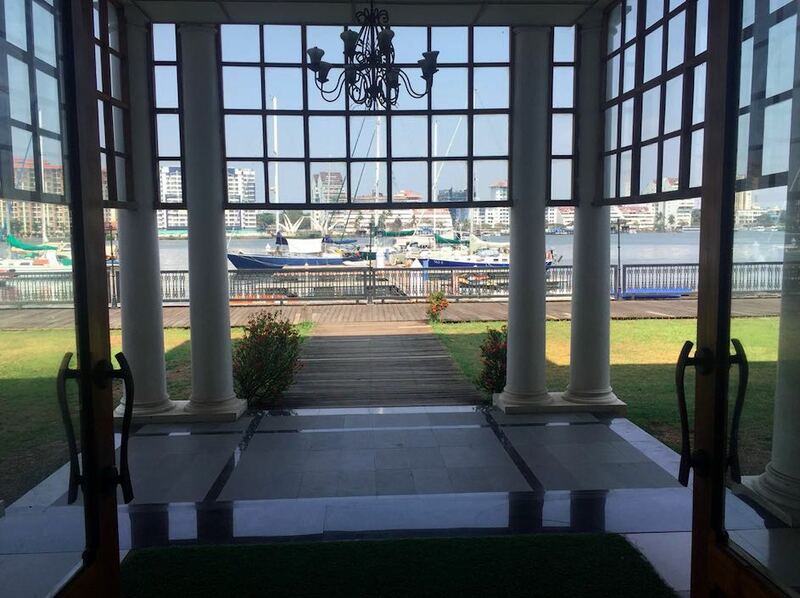 We are staying at the Kochi International Marina at Bolgatty Palace Resort. More on that in the future. This is a view (from shore side) as you enter the marina property. 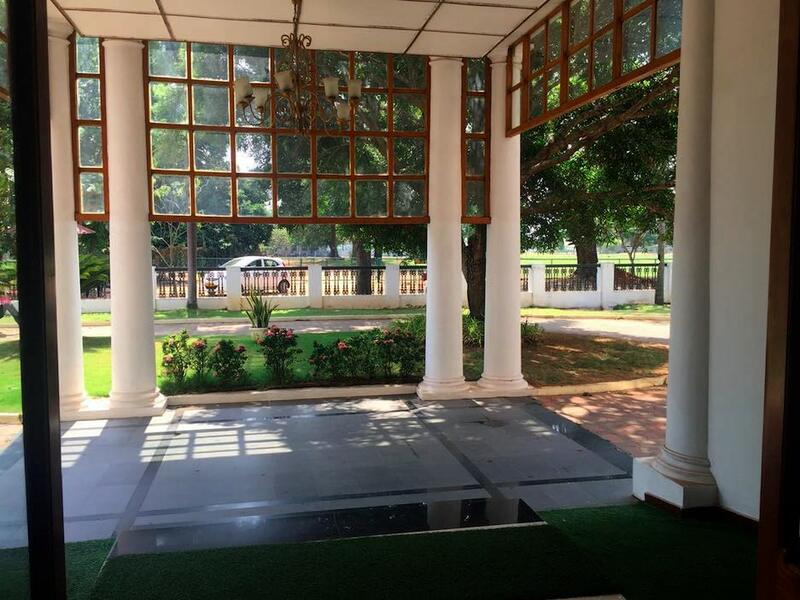 This is a view as you walk through the building and see the docks and our boat at the end. This is one of the thousands of “Chinese” fishing nets in the interior “back” waters. Apparently they lower them in the evening and then harvest fish and shrimp at night. It works. Since arrival, I’ve been seeing thousands of Royal Enfield bikes on the streets and several dealers. Some look brand new, although in the same styling from 40 years ago. As it turns out, Royal Enfield is an Indian motorcycle manufacturing brand with the tag of “the oldest global motorcycle brand in continuous production” – manufactured in factories in Chennai in India. 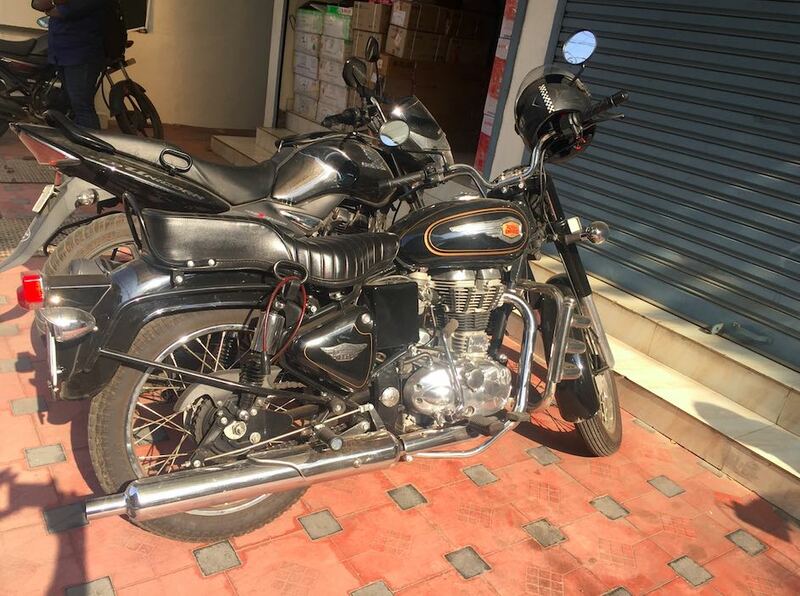 Licensed from Royal Enfield by the indigenous Indian Madras Motors, it is now a subsidiary of Eicher Motors Limited, an Indian automaker. The company makes the Royal Enfield Bullet, and many other single-cylinder motorcycles. First produced in 1901, Royal Enfield is the oldest motorcycle brand in the world still in production, yes, even before Harley Davidson, with the Bullet model enjoying the longest motorcycle production run of all time. This is just one of many in use. 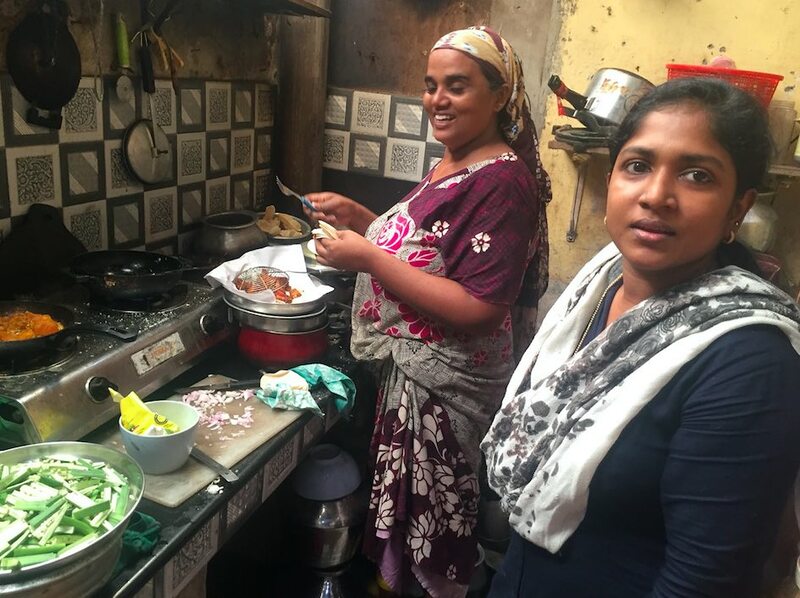 Our expectation of India was that we thought it would be hot, crowded, noisy, dirty and smelly. Well, it is all that – and more, and in a good way. We look forward to exploring this country further in the months to come.